Which president used the most hand gestures? Which president smiled the most? The least? Which party uses more negative language? In our human behavior research lab we analyzed these and other traits in the last 20 presidential inaugural addresses, Truman through Trump. 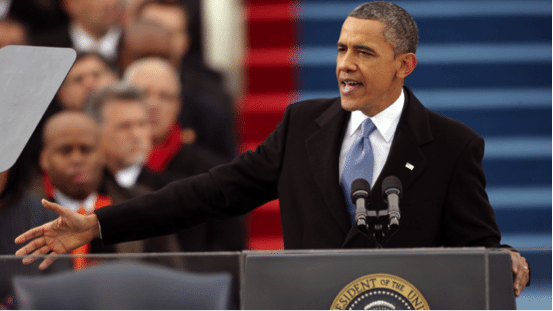 Were there differences in body language, verbal patterns and persuasiveness in each inauguration speech? 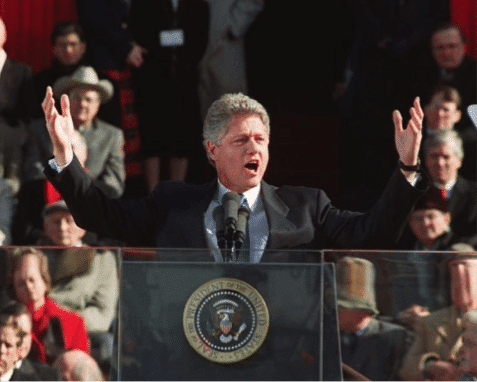 #1: Which president used the most hand gestures in his inaugural address? The correct answer: D. Donald Trump used the most hand gestures—641 in just 17 minutes! Ronald Reagan and Jimmy Carter relied too heavily on their podium and used none. Overall Democrats are more animated than Republicans. #2: Which president smiled the most in his inaugural address? The correct answer: B. Barack Obama (second term). George H.W. Bush was a close second! What’s interesting is every president smiled more in their second term inaugural address than their first—maybe they get more relaxed the second time around. John F. Kennedy and Harry S. Truman smiled the least. Republicans smiled more—but not by much! #3: Which president had the longest inaugural address? The correct answer is C. Harry S. Truman at 22 minutes. George W. Bush (second term) came in a close second at 21 minutes. The shortest of the last 20 presidential inaugural addresses belonged to Gerald Ford at eight minutes. Republicans are the more verbose party—Republican presidents spoke far longer than Democratic ones. 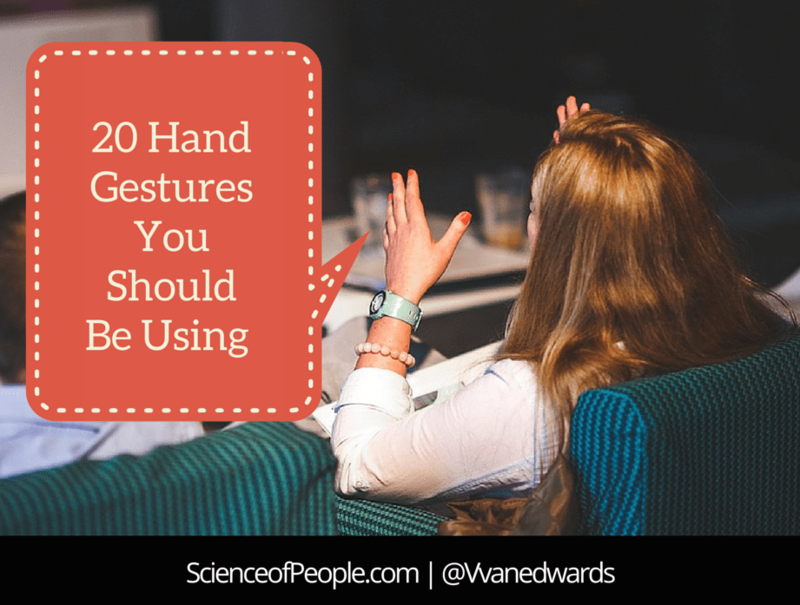 Want even more on the science of nonverbal cues and how they influence our perceptions? 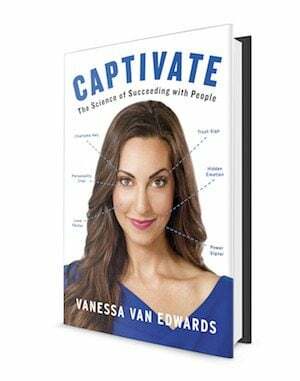 Check out our book, Captivate! 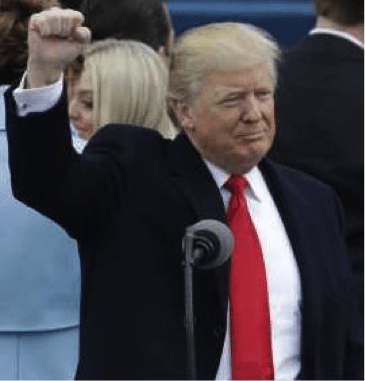 #4: Which tie color is the most popular in inaugural addresses? The most popular tie color is B. Blue, followed closely by red and a gray/blue mix. 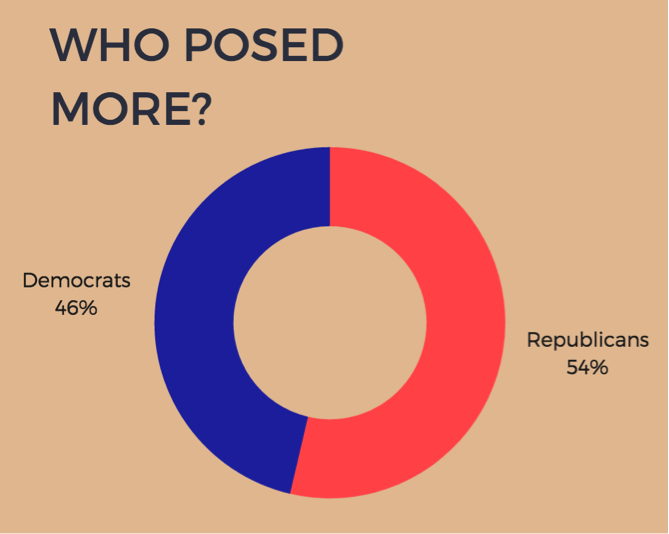 BOTH Republicans and Democrats wore blue and red—looks like their party’s logo color wasn’t a factor. #5: Which president had the worst weather during his inaugural address? We were curious about who had the best and worst weather days. Who had bad luck? The correct answer: A. Ronald Reagan had the worst weather during his inaugural address–a balmy 7.2 degrees! John F. Kennedy and Barack Obama (First Term) also had chilly speeches! #6: Which president used the most pride poses in his inaugural address? Researchers from the University of British Columbia[i] found that winning athletes use broad, expansive gestures. 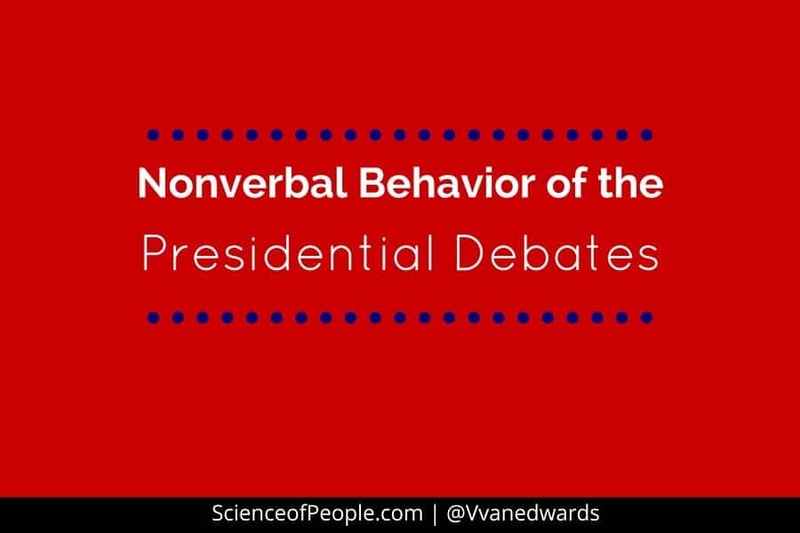 We coded presidential candidates on their alpha body language – or expansive gestures. 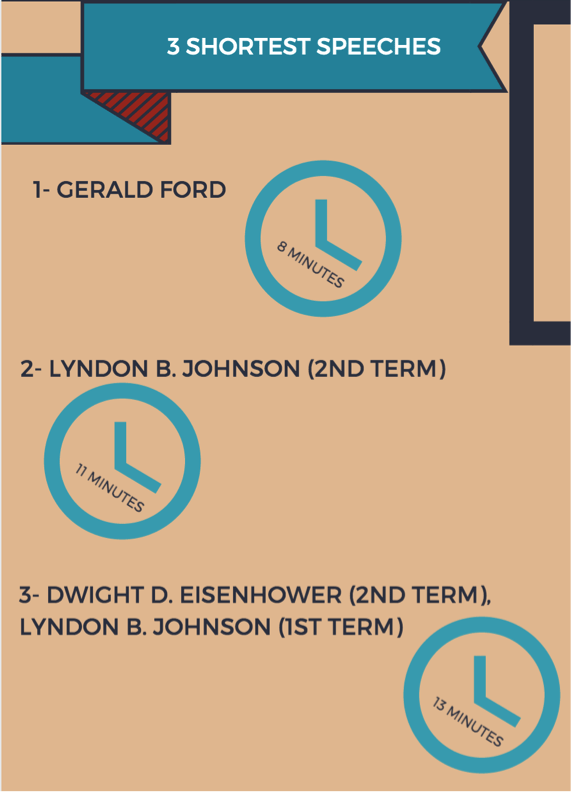 Which president posed the most? The correct answer: C. Donald Trump showed pride 20 times. Barack Obama (Second Term) Showed pride 8 times. Bill Clinton (First Term) Showed pride 4 times. 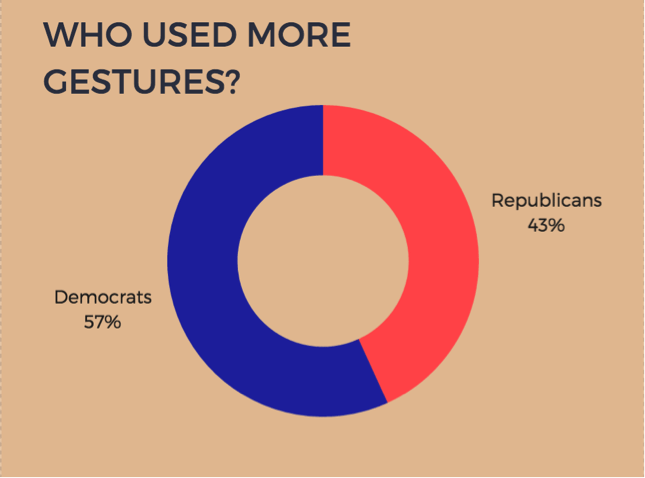 Overall Republicans use slightly more pride gestures than Democrats. #7: Which president used the most emotional language in his inaugural address? The correct answer is D. George W. Bush used the most emotion in his inaugural address, while President Johnson used the least. 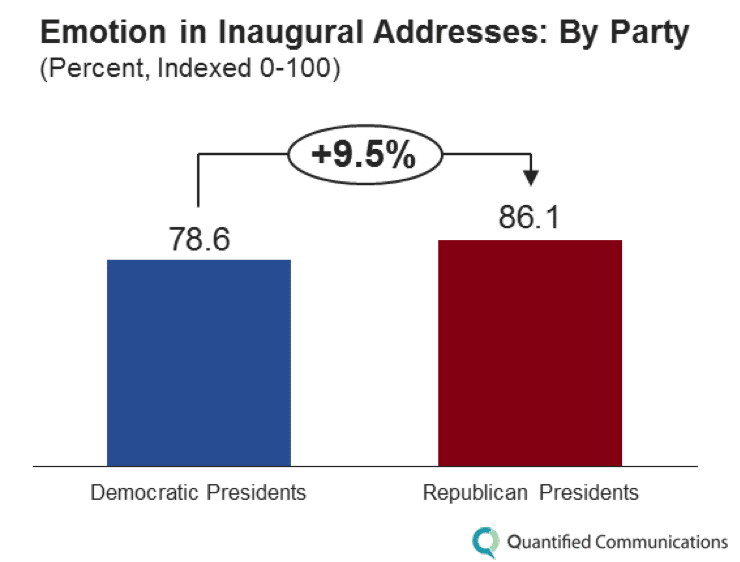 Republican presidents used 9.5% more emotion than Democratic presidents during their inaugural addresses. #8: Which president used the most logic in his inaugural address? The correct answer is A. President Harry S. Truman used the most logic in his inaugural address, while President Barack Obama used the least. 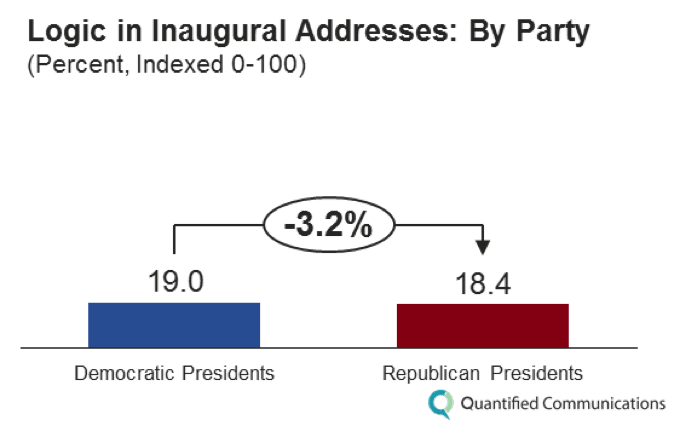 Republican presidents used 3.2% less logic than Democratic presidents during their inaugural addresses. #9: Which president used the most negative language in his inaugural address? The correct answer is B. President John F. Kennedy used the most negative language in his inaugural address; President George H.W. Bush used the least. 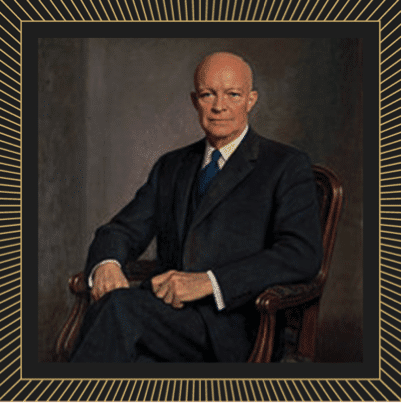 President Eisenhower used the most positive language in his inaugural addresses; President Johnson used the least. 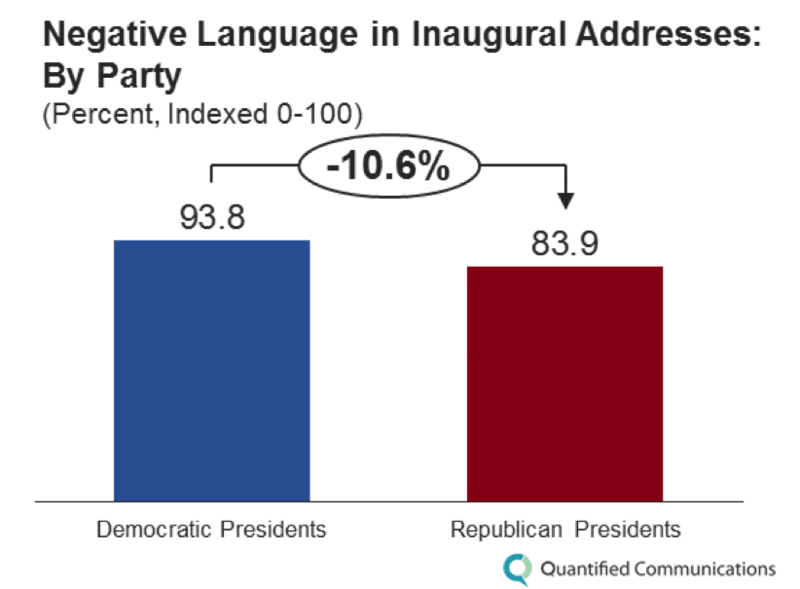 Republican presidents used 10.6% less negative language than Democratic presidents during their inaugural addresses. Republican presidents ALSO used 8.4% more positive language. Looks as though the Democrats tend to sway more negative to neutral in their speeches. 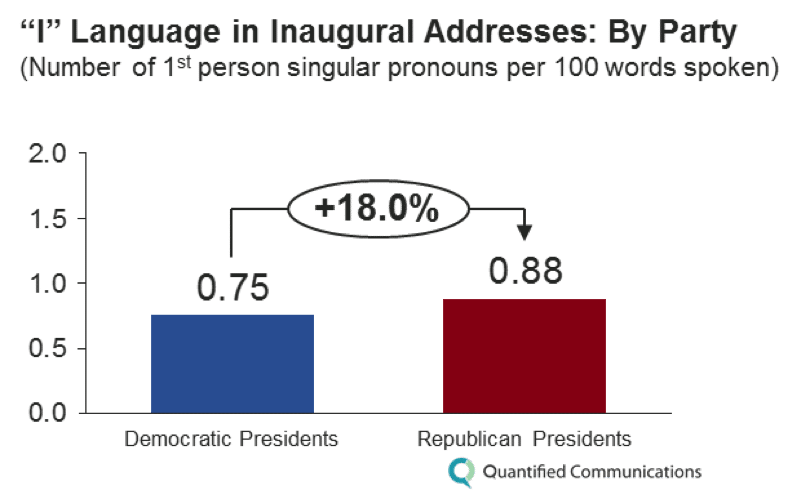 We also found that all but one two-term president used more positive language in his second-term inaugural address – the same happened with increased smiling in second-term speeches. Presidents definitely feel more optimistic going into their second term—at least that is how they come across. #10: Which president used the most individualistic language (“I, me and my”) in his inaugural address? 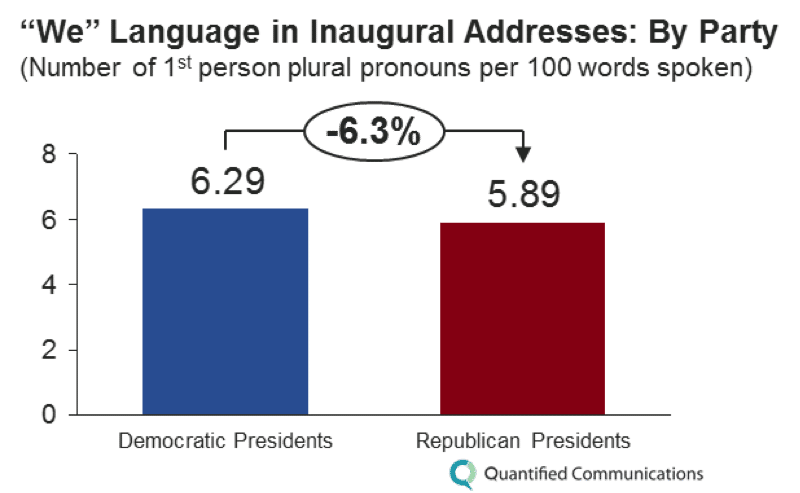 The correct answer is C. President Lyndon B. Johnson used the most “I” language in his inaugural addresses, while President Obama used the least. President Jimmy Carter used the most “we” language in his inaugural address, while President Harry S. Truman used the least. 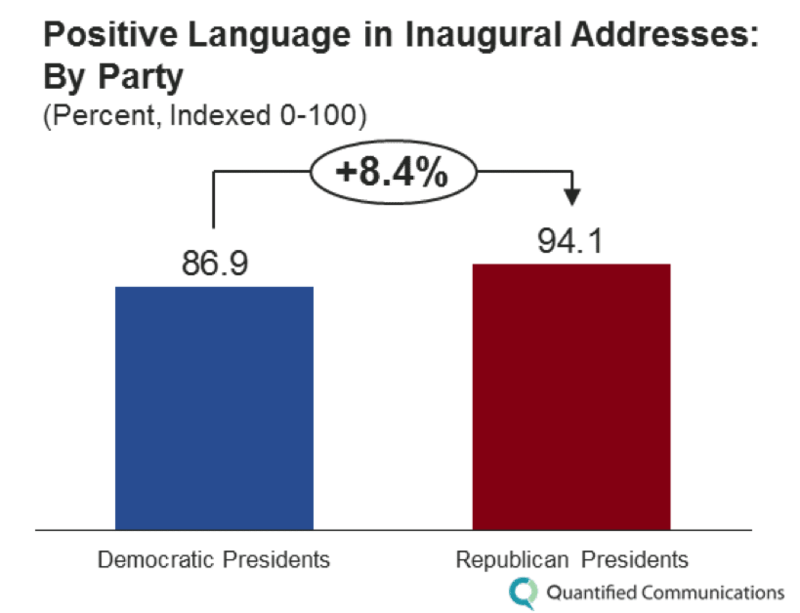 Republican presidents used 18.0% more “I” language than Democratic presidents during their inaugural addresses. 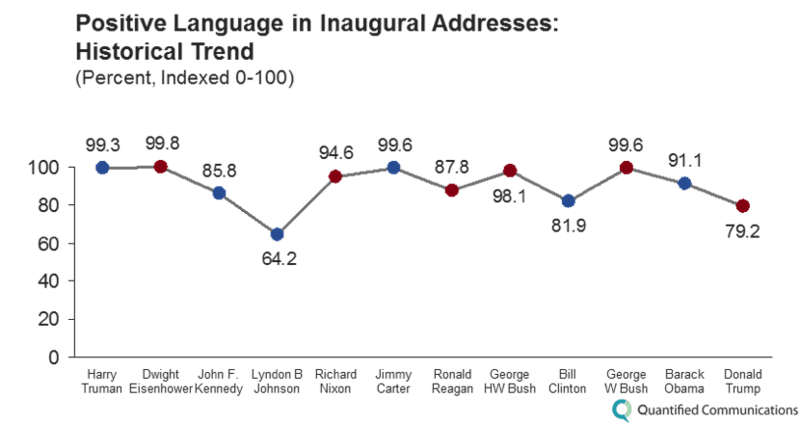 Republican presidents used 6.3% less “we” language than Democratic presidents during their inaugural addresses. This again points to the idea that Republicans tend to emphasize the individual, where Democrats tend to focus on fostering more community. #11: Which president used the most storytelling language in his inaugural address? Storytelling can be a very persuasive way of speaking, which appeals to a broader audience than just using logic or data. It is also a more emotional appeal to listeners than statistics alone. How did the presidents compare? The correct answer is C. President Lyndon B. Johnson used the most storytelling language in his inaugural addresses, while President Harry S. Truman used the least. Remember, Harry S. Truman also used the most logic—data and statistics. Clearly, he did this in lieu of stories. 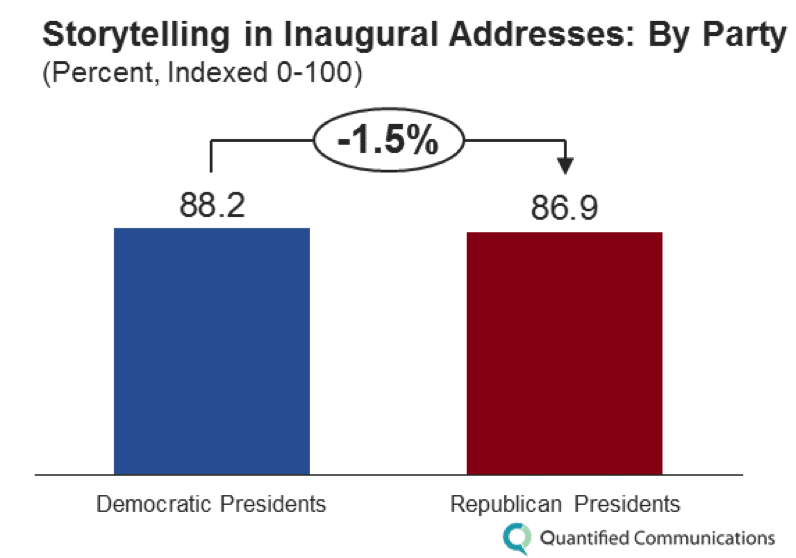 Republican presidents use only 1.5% less storytelling language than Democratic presidents during their inaugural addresses. 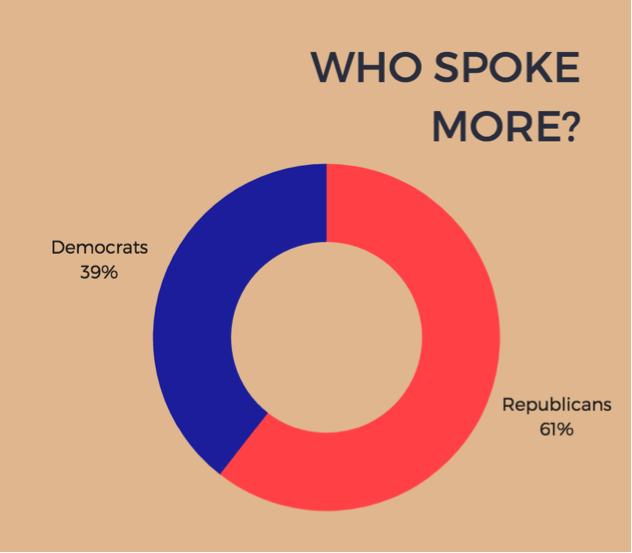 #12: Which president used the most trustworthy language in his inaugural address? The correct answer is B. President Jimmy Carter used the most trustworthy language in his inaugural address, while President Harry S. Truman used the least. 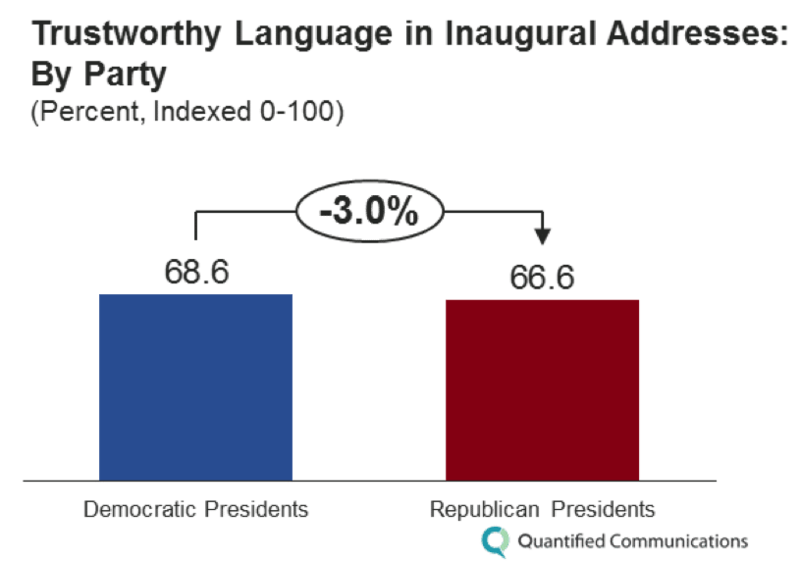 Republican presidents used 3.0% less trustworthy language than Democratic presidents during their inaugural addresses. #13: Which president had the most clarity in his inaugural address? The correct answer: A. President George H.W. Bush used the clearest language in his inaugural address, while President Harry S. Truman used the least. 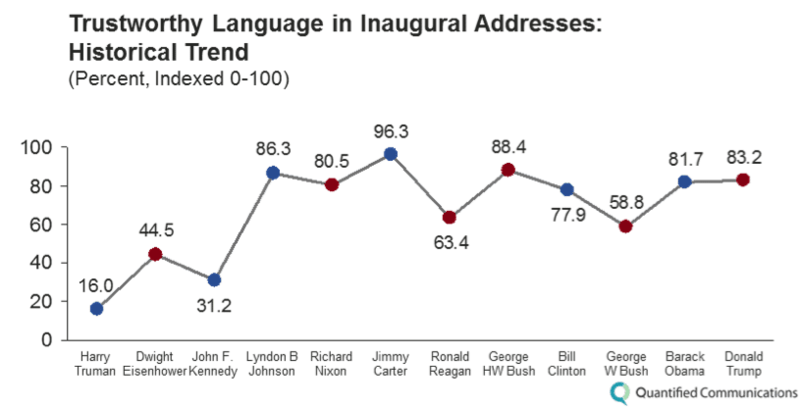 Republican presidents use 9.2% clearer language than Democratic presidents during their inaugural addresses. It is clear both parties have patterns. Republicans tend to use more emotional language, more stories and intense words (both positive and negative). Democrats love data and logic. They are more likely to use neutral language. Our presidents who used nonverbal communication the most also have been our more recent ones–Donald Trump and Barack Obama smiled and used the most hand gestures. Some findings surprised us, especially which presidents used more data and negative language. Many viewers believed Donald Trump’s inaugural address was one of the most negative we have heard in recent years. And here is where there is a special wrinkle in the data. Use of negative language was measured by frequency, not degree. Trump might have had less negative language overall, but when he was negative, he did not hold back. 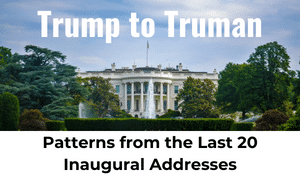 We examined the verbal and nonverbal patterns of all 20 presidential inaugural addresses given since Harry Truman’s in 1949. 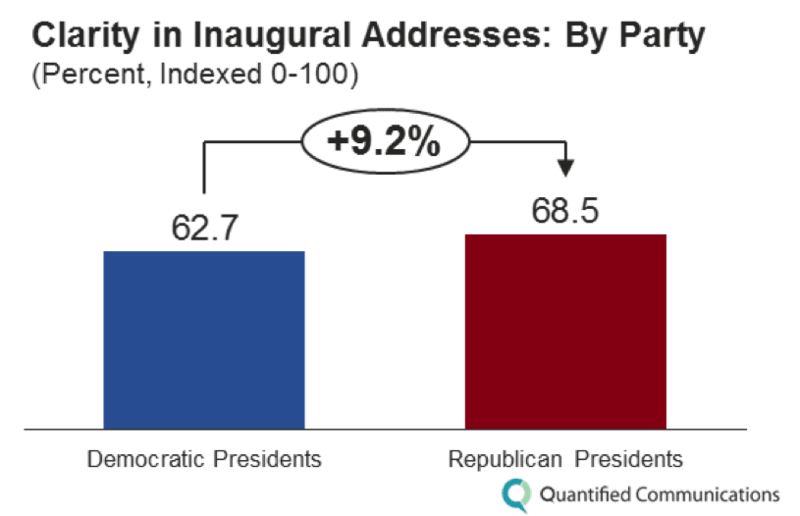 We compared 11 addresses given by Republican presidents and 9 addresses by Democratic presidents. The analysis also includes historical patterns. 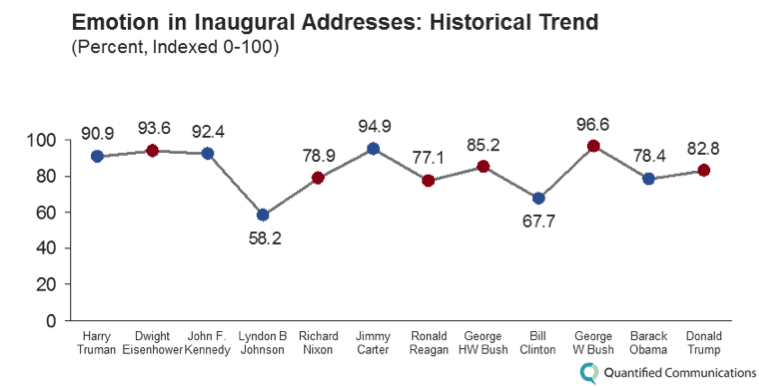 In the cases where a president gave a second inaugural address after being elected to a second term, the scores in each metric represent an average of that president’s two addresses. Looking at 13 different metrics for each address, we found interesting nonverbal and verbal patterns. For the verbal metrics, we partnered with Quantified Communications to use their communication measurement platform to analyze the transcript of each speech. 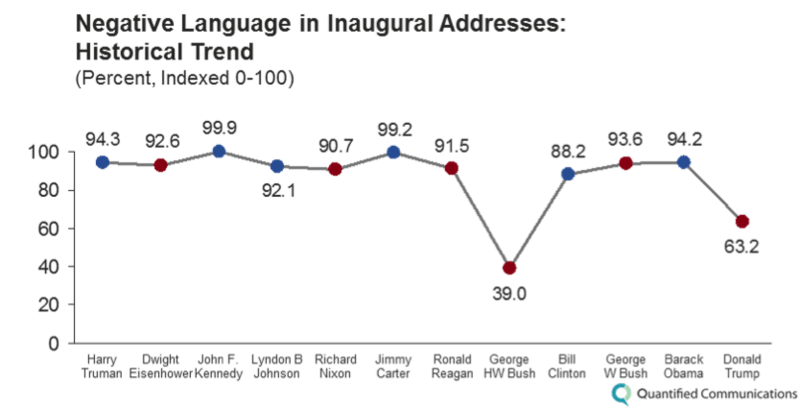 Our next steps will be to look at any correlations between starting approval rating and inaugural address patterns. Let’s see what we find next! 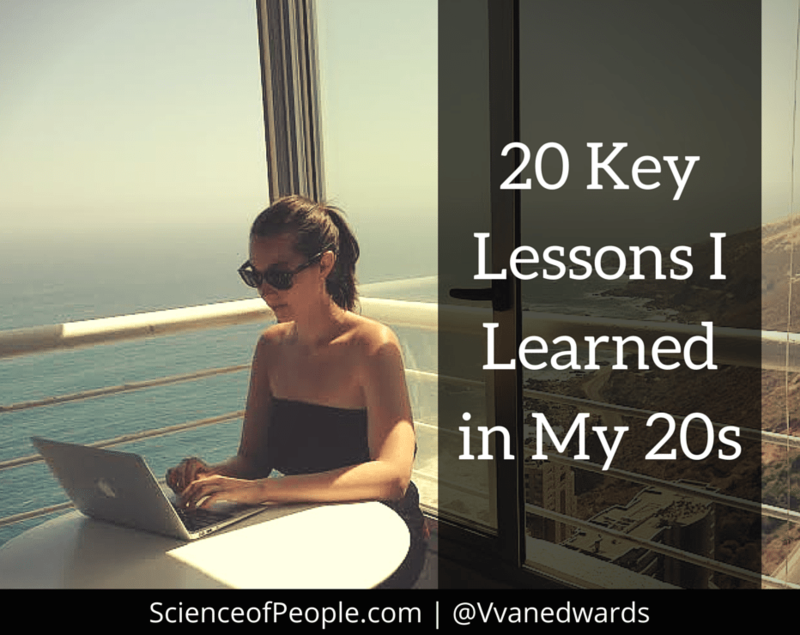 Vanessa Van Edwards is a behavioral investigator and published author. 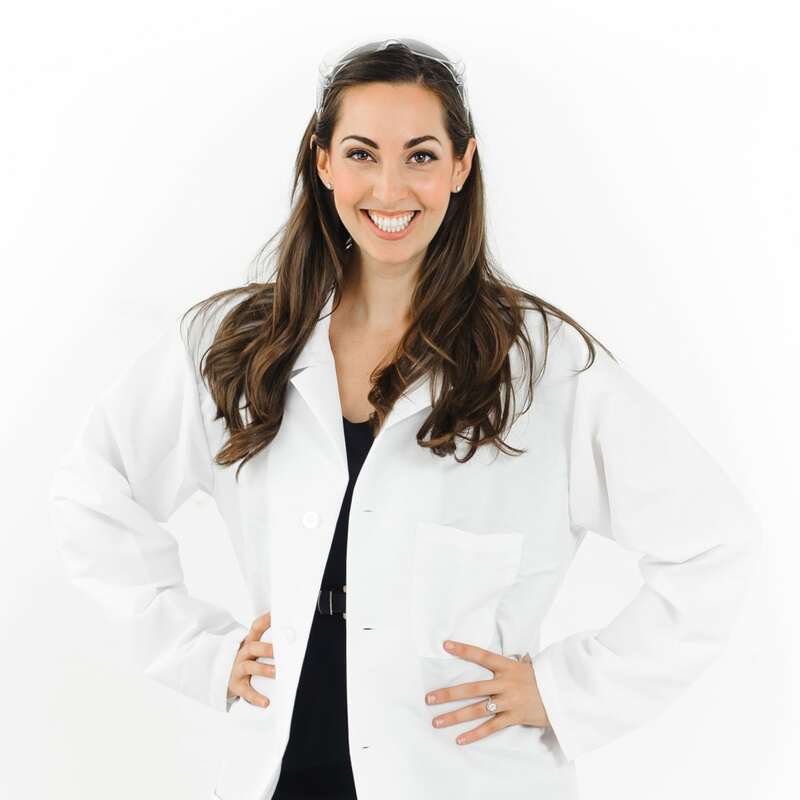 She figures out the science of what makes people tick at her human behavior research lab, the Science of People. As a geeky, modern-day Dale Carnegie, her innovative work has been featured on NPR, Business Week and CNN. Quantified Communications is our analytics partner. 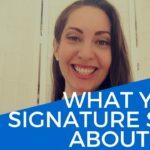 The QC platform, built on years of scientific communication research, uses a combination of natural language processing, automated vocal analysis, and insights from a panel of Ph.D.-level communication experts to help the leaders across the globe measure and improve their communication. QC’s work has been featured on WSJ, Business Insider, Forbes, and the TED mainstage. A Note on Quantified Communications’ Data: With the exception of the pronoun category, the research-validated algorithms used to score each metric are composed of several linguistic attributes proven to measure that particular element of communication effectiveness. QC uses natural language processing to measure each communication, then index the raw scores in each metric against millions of data points in their global communication database. The % scores in each metric reflect how that speaker performs compared to the average communicator in that database. [i] Greatness in the White House: Rating the Presidents, Washington through Carter,” (Pennsylvania State University Press, 1988). [ii] Bull, Peter. Body movement and interpersonal communication. John Wiley & Sons Inc., 1983.